Mrs. Myers’ office is located right next door to the main entrance of FSLMA’s Media Center. Her door is always open! 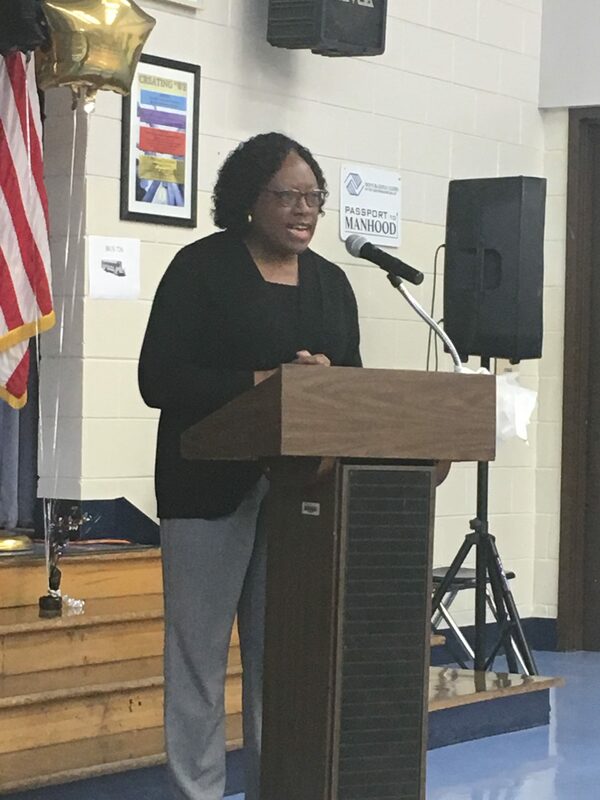 Guidance counselor, Mary Myers, presenting at the FSLMA Spelling Bee, December 6, 2018. I am Mary Myers ,and I am available to assist students with making good decisions throughout their middle school years at Fort. Please visit my page on a regular basis for the latest information about counseling programs, upcoming events and guidance tips. The purpose of the guidance and counseling program is to promote and enhance the learning process of all students. The mission statement is in support of the MCSD whereas is to become a lifelong learner, enter the work force, with the necessary skills to enter the workforce, college, or the military. I serve the needs of all students through classroom guidance, small group counseling, school-wide activities and individual counseling. In addition, I collaborate and consult with parents, guardians, administrators, teachers, and the community. Guidance Sponsored Programs include but are not limited to peer mediators, junior marshals, passport to manhood and college career readiness. Required ongoing groups include grief, transition, anger management, bully prevention, and junior student 2 student. Mary Myers and WTVM meteorologist during Career Day, 2018.